This Friday night Josh Thomson will face off against Pablo Villaseca in the main event of Bellator 147. The bout will mark the second time Thomson has fought in the round cage of Bellator. It is also only the second time in his career that he has faced fighters with a highest quarterly ranking above 100 in back-to-back fights. The former Strikeforce champion is a heavy favorite against Villaseca. 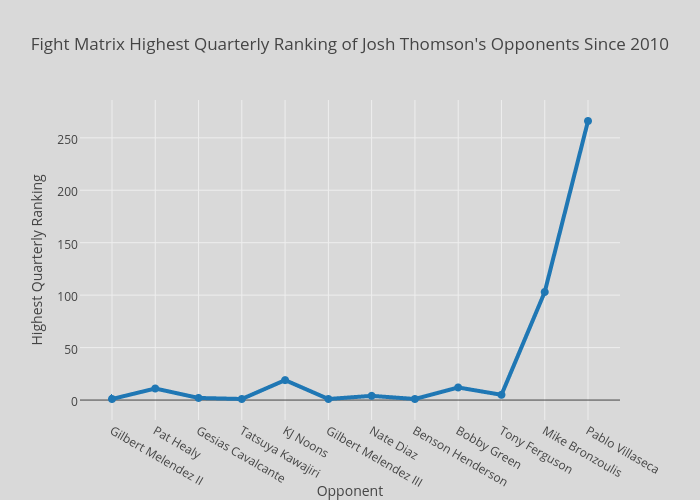 Thomson’s Chilean opponent is 10-1 as a professional, but his highest quarterly ranking for Fight Matrix is 266. Thomson’s previous opponent in Bellator, Mike Bronzoulis, has a highest quarterly ranking of 103. Based on strength of schedule, this fight appears to be less about competition and more about setting up Thomson to face one of Bellator’s handful of high-caliber combatants with some semblance of a win streak to his credit. Looking at Thomson’s overall MMA resume further highlights the gap between he and Villaseca but could prove useful in predicting how Thomson stacks up with the rest of the Bellator lightweight division. Prior to joining Bellator, he spent the majority of his career in Strikeforce and the UFC. While both promotions experienced success until the UFC purchased their competitor, there was always a significant difference in match making style. Is the difference a fundamental difference in philosophy or dictated by access to highly ranked fighters? The answer is most likely both. During his two UFC stints, Thomson fought seven times, winning three and losing four. Although his second go-around was less successful—perhaps reflecting the expansion of the sport’s talent pool from Thomson’s early days—he did record a highlight reel knockout of Nate Diaz and remained competitive in his final three UFC fights (all losses) against high caliber, younger opponents. His opponent’s average highest quarterly ranking was 13. During that stretch, he faced two fighters with a peak of number one. Six out of his seven opponents have peaked inside the the top 15. Thomson’s run with Strikeforce paints a slightly different picture. Of his fourteen opponents, 13 were ranked in the Fight Matrix database. The average highest quarterly ranking of his opponents was 67. If we remove the three bouts that Thomson had against Gilbert Melendez, who has a peak ranking of number one, that average falls all the way down to 87. Quality of opposition aside, Thomson clearly needs to rehab his image and standing as a fighter to erase his three-fight UFC losing streak. Bellator president Scott Coker, who previously helmed Strikeforce, seems more than willing to assist his former champion with that task. Partly by design and partly by necessity, Bellator’s 155-pound roster doesn’t lend itself to a gradual climb up the rankings. With a stable of young, relatively unknown competitors and a few top-level fighters at the top, there really isn’t much in between. The following chart illustrates the Bellator rehab plan. 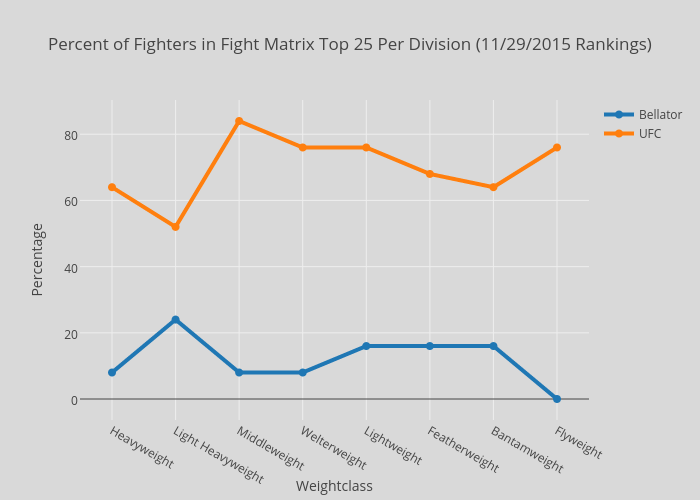 The lightweight division has long been one of the strongest in the promotion and currently boasts four fighters inside the Fight Matrix Top 25: Marcin Held (23), Thomson (16), Michel Chandler (13) and champion Will Brooks (4). Four fighters ranked in the Top 25 might not sound like a lot, but it is good enough for second best in Bellator. The following chart shows how difficult it is for a promotion to compete with the UFC and their stranglehold on top talent. So yes, Thomson should beat the majority of the lightweights Bellator can offer, but it’s less clear how he’ll fare against the likes of Brooks, Chandler, and Held. His fight with Villaseca, barring a huge upset, won’t tell us much. Hopefully for Coker and company, it can help revive one of the bigger stars from Strikeforce’s heyday.